Divorce is always painful. Recovery after the experience can be difficult and can seem hopeless. Yet there are definitely steps that a divorced person can take, to heal the wounds both of a painful marriage and an ugly divorce. There is life after divorce and although it may never again be as naive and simple, it can be wonderful and filled with happiness. The Complete Divorce Recovery Handbook is the product of interviews with many divorced men and women, plus research, plus a community of single adults committed to taking the hand of people going through divorce and walking with them as friends, through the swamp of loss, anger, sadness, broken dreams, etc. Although written twenty years ago it is still in print and still being used by thousands each year. You can order new or used copies on Amazon. 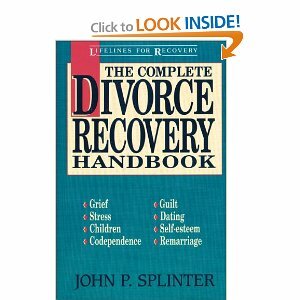 I am co leading a divorce recovery group in California and we would like to use your book. The book from 1992 has bold print and is a bit hard to read. Is there a more recent printing, or would there be an electronic version we could purchase and download?